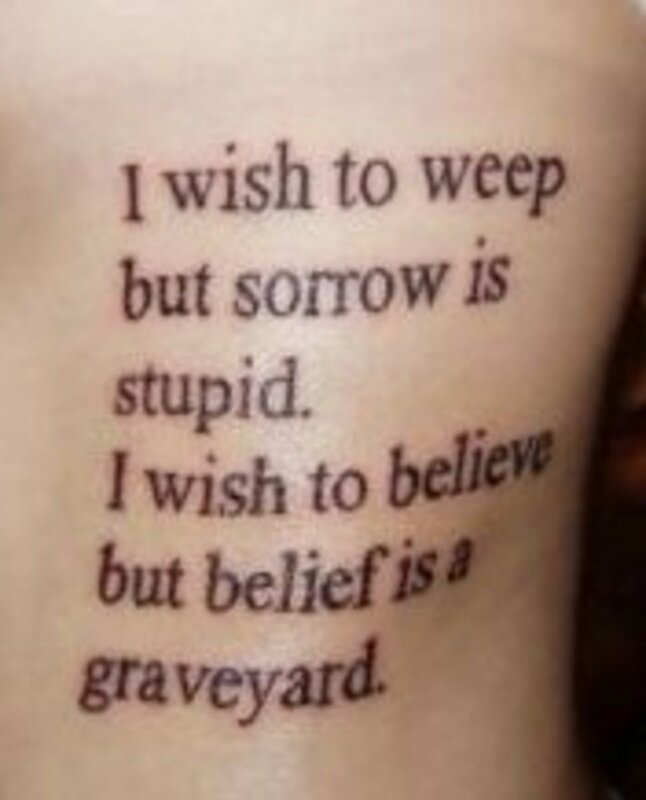 Of the thirteen tattoos I have permanently inked onto my skin for all time, four of them contain words or phrases. There's a single word on my lower stomach that hails from the Elvish language created in the "Lord of the Rings" saga by J.R.R. Tolkien, "wake your dreams" is on the back of my neck, "i only want now" is located on my lower back, and a Polish quote that means "anything I could desire, I already have" wraps around my upper bicep. As an avid reader and obsessive writer, I have maintained a love affair with the written word since learning how to read at age four. No matter how many times I tell myself, "Okay, my next tattoo is going to be an image", I always seem to end up getting more words. We use words to convey meaning and express desire, to give solace and provide comfort, to impact and inspire. 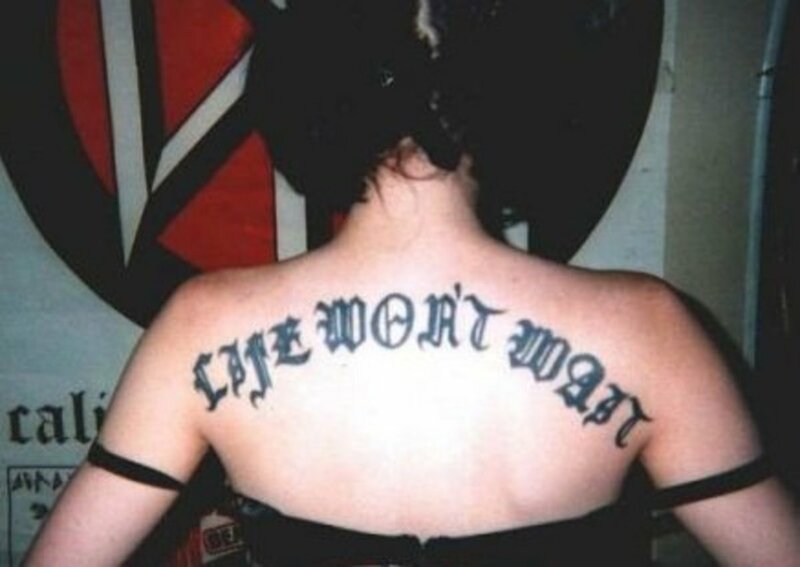 Getting someone's name tattooed can be a permanent memorial of a loved one who has passed away; inking the initials of your partner's name on your body can represent your eternal commitment to one another; a quote from a favorite book or movie can serve as a daily reminder to live the ideals expressed in that particular saying. And with so many different languages in the world, the possibilities are endless. Famous actress Angelina Jolie has a Pali incantation written in Khmer, the native language of her adopted son's birthplace, Cambodia. Others choose Japanese "kanjii" characters to represent the word or phrase they want to display. Keep in mind, however, that if you get a tattoo in a different in a place that is easily visible to passersby, you will constantly be asked the same question over and over again without fail: "What does your tattoo mean?" If you're thinking about getting a tat, keep in mind that ideas are all around us at any given moment. If you have a favorite song lyric, instead of getting the actual words, think about getting the corresponding music notes or guitar tabs. If you're interested in getting yours or someone else's name, select a fancy font like Old English to make it interesting. Binary and barcode tattoos are also very popular right now because websites like Nickciske.com can be used to turn words and phrases into a series of numbers that only you will be able to understand. I am constantly on the lookout for new tattoo ideas, and currently I am considering two in particular: a quote by artist Kurt Halsey tattooed on my wrist that says "we are more than most will ever know" or a line from Dr. Seuss' children's book The Lorax which reads "unless someone like you cares a whole awful, nothing is going to get better--it's not." 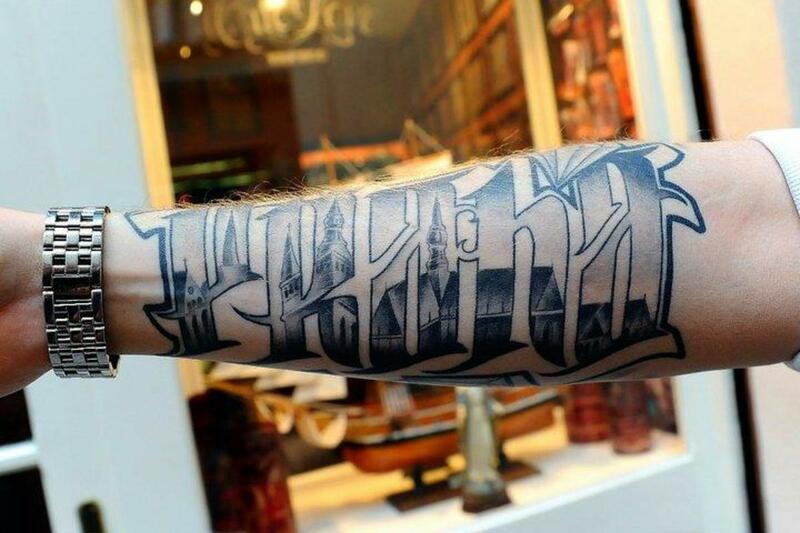 Here are some examples of the many things you can do with lettering tattoos, all courtesy of the wildly popular Bmezine.com. 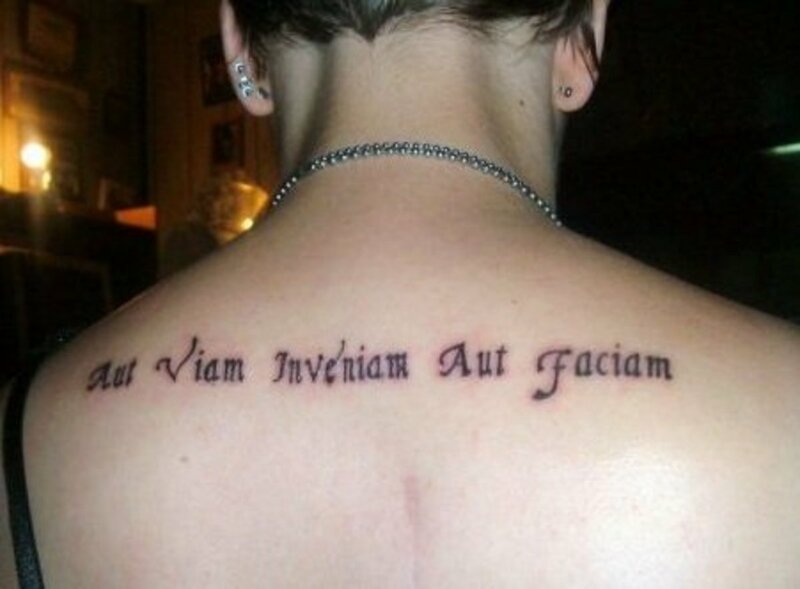 Latin for "Either I will find a way or I will make one." hola gente, queria escuchar un consejo... mi historia es la siguiente, hace muy poco tuve la descgracia de perder a mi mama por causa de una enfermedad.. quisiera hacerme un tattoo en su honor, tenia pensado una cruz con sus iniciales arriba o una frase qe diga "el cielo no supo esperar" o algo parecido.. no tengo ninguno echo y no se como ni que hacerme.. espero alguna ayuda, gracias por su tiempo! i want some sort of script on my ribs, im only 16 so im worried about it stretching over time if anyone has any information about that? but other than that i really want a short script on my ribs probably in Italian does anyone have any ideas for inspirational/ motivational quoting or wording? i already have 4 tattoos chosen and im only nine!!! 1. a crying eye on the inside of my left wrist. it represents that sometimes you have to take risks and if they dont sucseed dont give up and dont cry. 2. a phrase on the inside of my left arm saying "life doesnt wait" meaning that you have to just feel free and do what you want when you want. 3. "shhh" going up my left finger so i can easily shhh people when needed!!! 4. a diamond at the end of life doesnt wait to show my sucsess in life. I'm getting a tattoo of a pocket watch and a scroll, in the scroll i want something meaningful about time/life/carrying on sort of things, but only 2 words. anyone keen to help out? Ashh@ "Only the strong survive"
"And Beauty is the ease required for you to understand that single frame of animation"
7 years ago from N.J.
i have gothic angel wings the full lenght breadth of my back with the latin phrase "alis volat propiis" - "she flys with her own wings" it can also mean "he flys" i also have 6 others and im currently deciding on a new one tattoos.....one of the only things that are truly our own from artist to grave i love mine!!!! I was in a car accident and had lost my grandfathers cross necklace which i have worn since i was young. so i am planning on getting "By Faith, Not Sight" with a simple cross. good or bad? i have a tat between my shoulder blades. " feel the fear, but do it anyway"
hi i have been thinking about this tattoo 4 a while wings on th top middle ov my back with th words- untill you spread your wings u will have no idea how high you can fly. 'everything happens for a reason' but not sure where or maybe something little like 'believe or hope or dream' any ideas would be great!! i'm 18 and i'm thinking about getting a tattoo on my right wrist saying "bruised but never broken". it's mainly because of health problems i had as a baby (i almost died with a tumor in my brain) but it also can be aplied to some moments in life. lots of people are telling me to wait and think about it because its for life, but i'm thinking since january and i really want to do it. what do you think? Also, i want a quote on me by marlin monroe it says imperfection is beauty,madness is genius,its better too be absolutely ridiculous than absolutely boring, i want this on me but im undecided where on my body.. Any suggestions on where on my body?? I am 23 years old,I Have my daughters name with her middle name on my right inner arm, two matching pink corsets on the backs of my legs because i have always wanted them, and a star gazer lily on my left shoulder blade, its my moms favorite flower. Hi, I'm french and I'm 16. I already have a tattoo in the wrist which represents my parents and I want to make the sentence "music never stops" in the low back. You find that good ? Or other ideas ? And sorry if my english is not good. I am looking for a tattoo that represents change and finding myself. I researched that the dragonfly means this but I am having a hard time trying to decide where I want to get it. Also I am trying to find a small quote about change, any ideas? My dad passed away on 6/12/11. I am 15 years old and i'm going to get a tattoo for my 16th birthday. The words im using are " Forever gone, but never forgotten"
:Keep on dreaming even if it breaks your heart. is there anyone who can translate this buddha quote to japanese ? "It is better to conquer yourself than to win a thousand battles,because the victory is yours it cannot be taken from you angels ro demons, heaven or hell"
Dont hate me because u cnt b me!! words r jst words,thy cn mean anythin otherwise nothing is true,everything is parmitted.....haha,i jst made dat up! can anyone translate for me ? "You cant take nothing for granted and you cant take granted for nothing" in elvish? what do you think about 'cry when you have to, laugh when you can' written down my arm in like old English font? "I watched myself fall asleep, and then I flew away..."
"Living is easy with eyes closed, misunderstanding all you see..."
"Yesterday, all my troubles seemed so far away..."
"In a land of make believe, that don't believe in me..."
"i found myself so far down, away from the sun again..."
im getting "we will be victorious" round my wrist! in memory of my friend who died of cancer and we all gave out bands that had we will be victorious on, because of him. I have a tattoo on my rib cage right now an it says "though I walk through the valley of the shadow of death, I will fear no evil" and I'm looking to add a design to it... Any ideas? Okey, I have been thinking a lot about what kind of phrase or words I wanna get. I'm thinking "forever young" on my neck. What do u guys think? Want a few words, something small but with a big meaning. What do u think of "going where my heart takes me" on the ribs? Pls give me some respons, it drives me crazy to wait for my first tattoo an my parents aren't so helpful. I have three, working on my fourth. 1st one was an immature permanent accident in which ive grown to love "peace & strength" across the back of my neck in kanji, 2nd was "she flies with her own set of wings" all the way down my spine in latin, and third "turn thy wounds into wisdom" across my collar bone. ive got " trust no-one" on left wrist and "fear nothing" on my write , i also got " Heaven's not only a place you go when you die, it's also that moment in life when you finally feel alive" down my rib cage ! 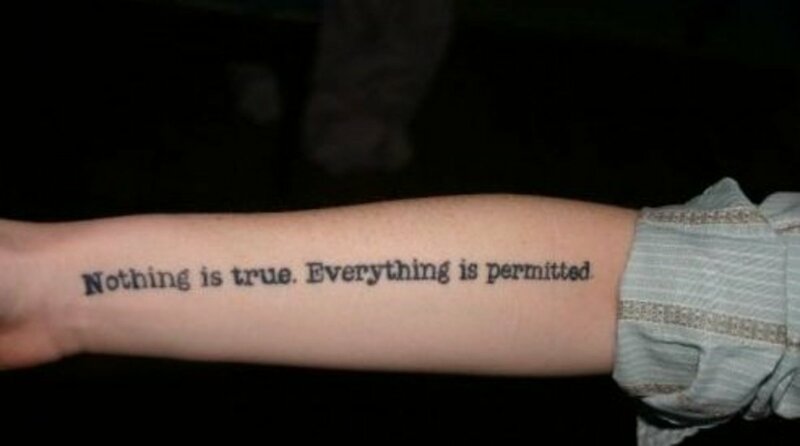 I got "To everything there is a season" tattooed up my right torso. Its from ecclesiastes 3:1. 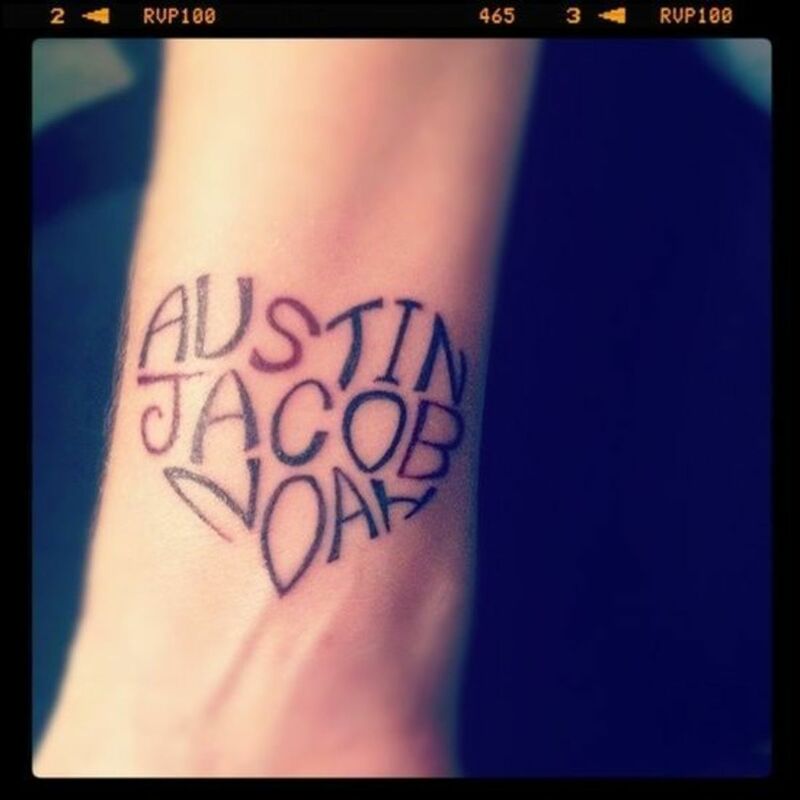 I think if youre gonna have just one tattoo, go big or go home. hi, ive always been a worrier and very nervous but every day im pushing myself more and more. 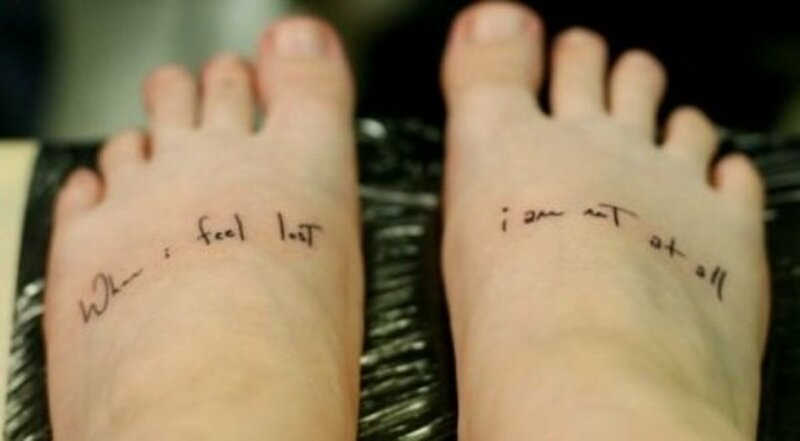 i want to get a tattoo on my inner wrist with either one word or short phrase and im having a hard time picking one. 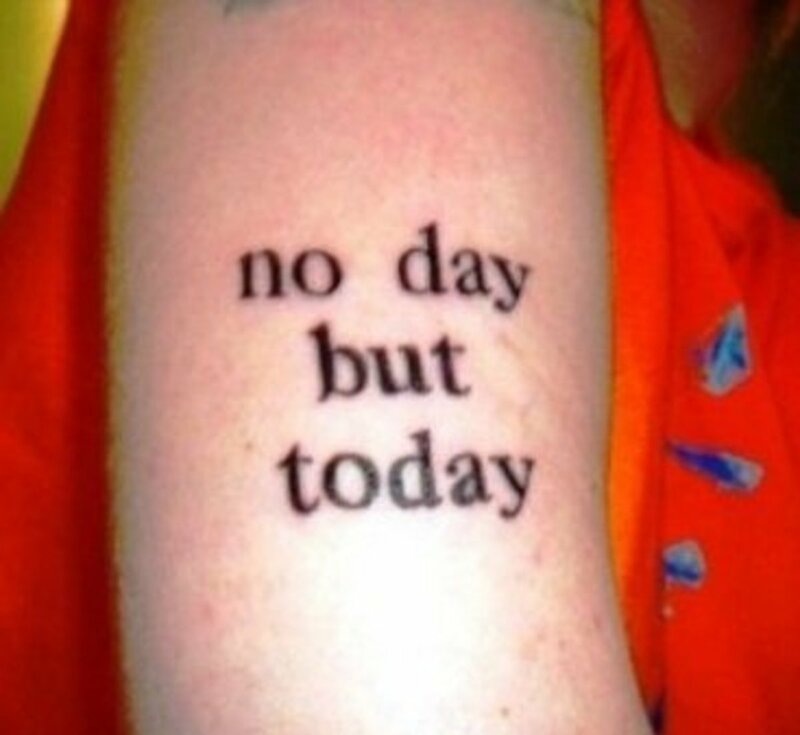 i was going to put faith or believe but not sure..i like the no day but today as well. idk. just looking for some ideas if anyone can help. my email is Lking4myprince@aim.com if ud like to help. Hey! this seems like a helpful site and i was wondering if anyone could translate how to say "No Worries" into Greek? I want a tattoo that says, "for those who have stood by my side,you are the story i tell" but i want in a different language. any ideas or translators?! I am 18 and what to get wake your dreams on my fore arm but also want to get something representing family members of mine that have been through cancer,there's 3 of them...any ideas please comment or email me evil.go@hotmail.co.za, I'm a guy. How long does a smallish tat on your fore arm tae to heal? I LOVE the "Nothing is true. Everything is permitted." The Assassin's Creed games are AWESOME!!!! I think I'll get that in a different way. hey guys! i am 19 and i got my first tatt when i was 17. I got "live like you were dying" on my hip with music notes around it. 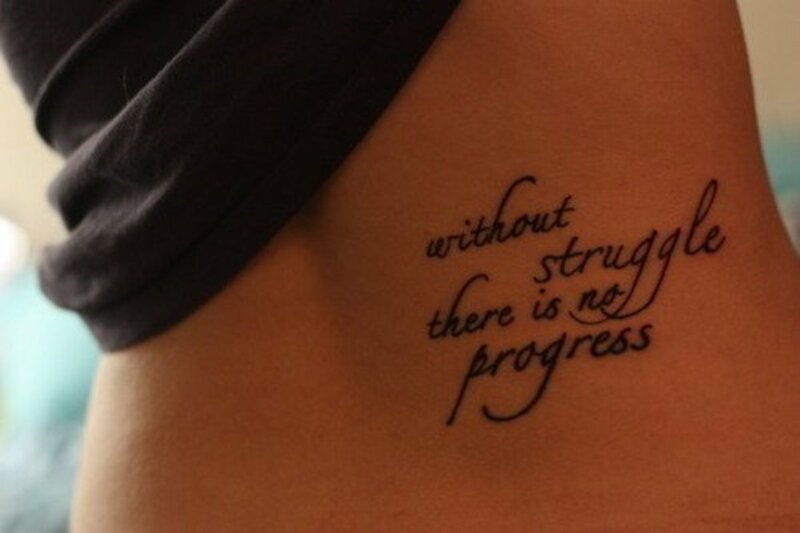 I thought it was very inspirational :) i love it! im up to 7 tatts and working on more .... im so getting the "wake your dreams" but here is on for you all......"real eyes realize real lies"
i like this, what do you think? i like- to live a creative life, we must lose our fear of being wrong. what do you think? Hey guys... So I gave birth to my first child 6 weeks ago (a boy) and I'm looking for a really inspirational one line quote that basically says how strong I am and how I have come out the other side a better person because I have no family through abandonment and have had to learn from a really young age to look after number one after going through a lot in my life I'm finally truly happy with my son and my new family and I cant think of a quote powerful enough to get this across any ideas?? I would really appreciate any suggestions :) thank you! I have a tattoo on my right wrist inner...the word " Sinner " with angel wings and a Halo. Its saying I'm not perfect and not afraid to own it. Nobodys perfect. Thanks for your kind comments, I'd love to let you see them. You will have to give me some instruction though as how to post!! I also have my name in Chinese or Japanese (can't remember which language!!) 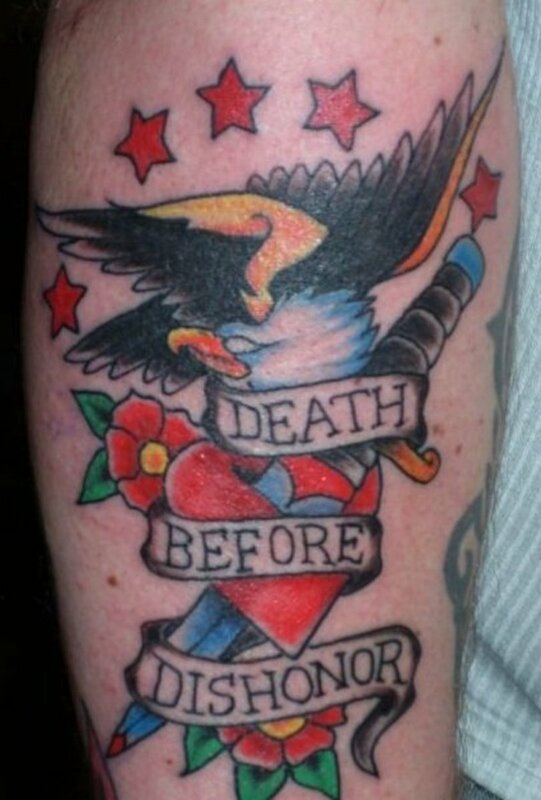 on my upper arm but not overly keen on that style anymore. 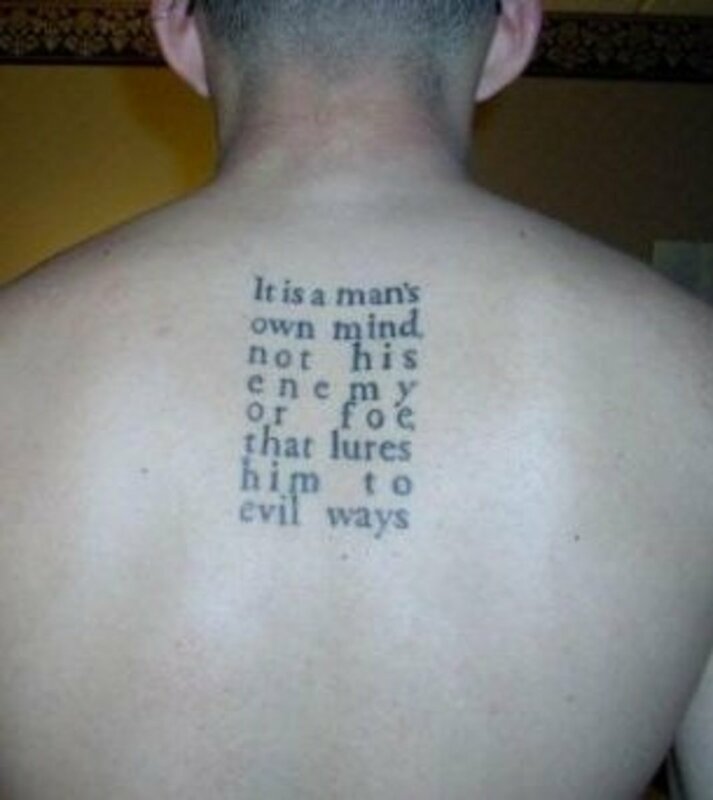 I have a few image tattoos too but always seem to go back to text, it's really intriguing as everyone always wants to know what it's says and why I had it. @Mb - I'd love to see pictures of your tattoos! I have a hub dedicated solely to Latin tattoos, and another for Elvish tattoos. It'd be awesome to be able to add your pics to the gallery. I have the Elvish word lumenn (meaning "to shine") tattooed on me, and I love it. Here's the links in case you're interested. I have Mors nos non disiungit tattoed on my chest which means death will not part us, Amor vincit omnia on my wrist which means love conquers all and also my sons name and dob in elvish on my forearm. I want either numquam moribimur on my forearm too which means we'll never die or ut amem et foveam which means whom I love and cherish (trouble with the latter though is David Beckham has it so maybe chavvy? 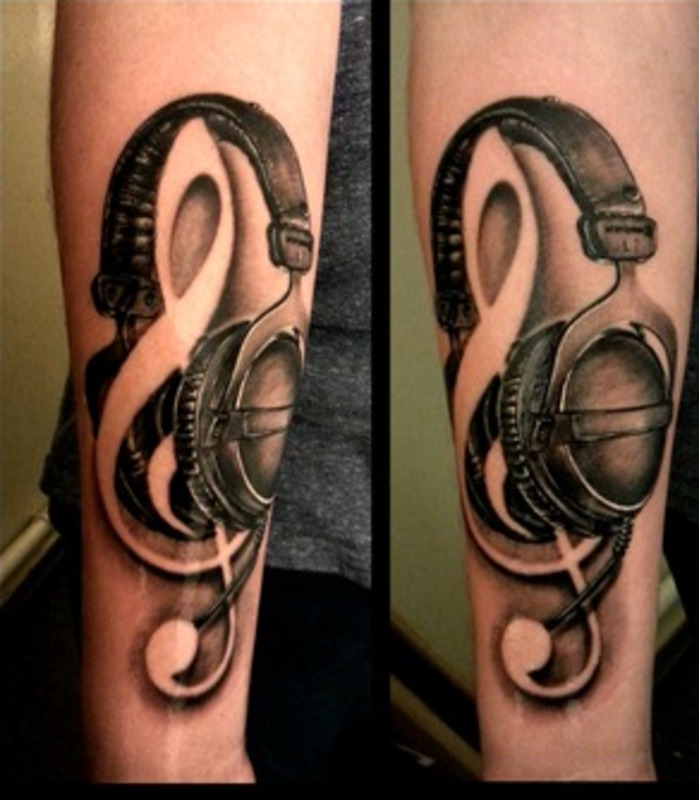 i like the sound of your's "live on, no regrets"
Also want a treble clef. Love this website and reading what tattoo's other people have and what they want! What do you think about word "Someday..." on my inner wrist? I have been thinking of having a tattoo on my ribs or wrist saying your the star in the sky and I am the apple of your eye. The reason is I lost my dad in feb this year so he is my star and I am his apple. Just not sure where to have it. Any ideas. Does anyone know the translation of "viva la vida" (spanish) to arabic?! Can someone translate "Awaken your dreams" into arabic for me please? I have a life like looking wave on my back for my grandparents, they bought me m first surfboard and its my favorite thing to do and the ocean is the place i feel them with me the most. whats a good quote like such is life but uncommon? As I gazed upon the heavens, I saw pages of my life. It was then I realized that You remained there by my side. I looked to only find one set of footprints on the ground. i plan to get a tattoo on my wrist that says my survivor.....its for my brother with cancer and has been battling it for 4 years now and he is still going strong! he has aplastic anemia and we can't find someone with the same bone marrow....but he is pretty much my hero!